Bathhouse No. 2 is a Bolgar city bathhouse built in the middle of the XIV century. Thickness of its walls composed of irregularity shaped stones with random traces of scabbling does not exceed 80-90 cm. 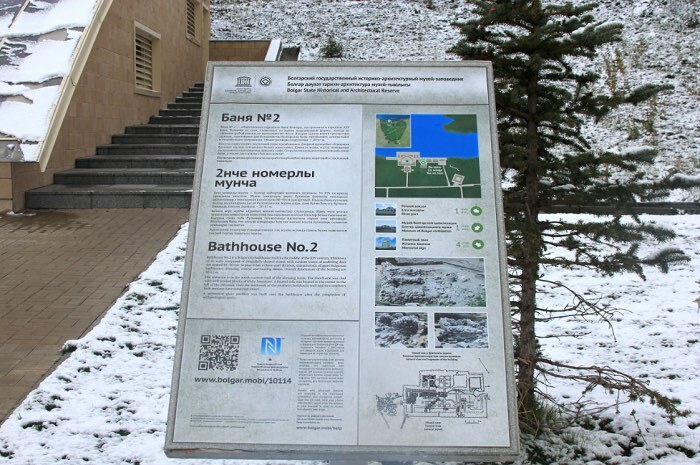 in plan it has a three-part division, characteristic of most Bulgarian bathhouses: dressing, central and heating rooms. Overall dimensions of the building are 20×11 m.
The entrance is in the south-eastern wall of the dressing room. The doorframe was clad with well-worked blocks of white limestone. A heated sofa was located in the corner to the bath sections have remained intact. A protective glass pavilion was built over the bathhouse after the completion of archeological works.